In keeping with a well-loved NPR holiday tradition, hear the third collection of extraordinary Christmas stories that will transport you to unexpected places. Audie Cornish, Ken Harbaugh, Nina Totenberg and other voices from NPR's past and present tell stories of the season in this hour-long special. The internationally acclaimed “little orchestra" Pink Martini bedecks the airwaves with festive holiday songs from across the globe. 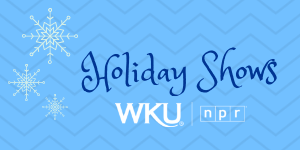 From timeless classics to rarely heard gems, hear a multi-denominational, multi-cultural jubilee, overflowing with enough holiday spirit to warm your entire family. Pipedreams host Michael Barone presents this live service of spoken-word and music broadcast from the chapel of King's College in Cambridge, England. The 30-voice King's College Choir performs the legendary Festival of Nine Lessons and Carols service of Biblical readings and music. Hear the Owensboro Symphony Orchestra along with the Symphony Chorus and Symphony Youth Orchestra from their holiday concert: Spectacular Sounds of the Season, recorded this December at Cannon Hall. One of the great holiday traditions in America, the choirs of Morehouse and Spelman Colleges -- two of the most prestigious historically black institutions in the nation -- get together to present a spine-tingling concert program. This encore presentation features the best works of the last several years. In keeping with a well-loved NPR holiday tradition, hear the fourth collection of extraordinary Christmas stories that will transport you to unexpected places. NPR's past and present tell stories of the season in this hour-long special. Celebrate the season amid a brilliant array of voices and musical selections, featuring the University of Louisville Cardinal Singers under the direction of Kent Hatteberg, Louisville Youth Choir Bel Canto ensemble under the direction of Caitlin Jennings, and pianist Harry Pickens, produced by Louisville Public Media and recorded Dec. 2 of this year. The Vienna Philharmonic presents its ever popular annual New Year's Day concert from the Golden Hall of the Musikverein in Vienna. You'll hear your favorite waltzes, polkas and more – a festive way to start off the New Year. Presented by NPR Music. This hour-long Hanukkah favorite returns: A celebration by The Western Wind performing Ladino songs of Spanish Jews, Yiddish melodies of Eastern Europe and modern Israeli tunes. Fiona Ritchie offers music and words to celebrate the holiday season. This Christmas, American Routes is serving up holiday platters for the many moods and sonic flavors of the season. We get down to some very merry Chicano rockabilly from Los Straitjackets; gather around the fire with French fiddlers in snowy Maine; imbibe “Sugar Rum Cherry” concocted by Duke Ellington; dream of a white Christmas a la Booker T. & the MGs, and hear the tale of Miles Davis‘ “Blue X-mas” from jazz composer Bob Dorough. Plus, cool Yuletide exotica from Esquivel, joyous free jazz from Rahsaan Roland Kirk and ring shouting for a New Year from the Georgia Sea Island Singers. Every holiday season, jazz musicians get in the Christmas spirit with fresh new recordings of traditional and original music. This year, Jazz Happening Now host Jeff Hanley will produce a new hour of 2018’s best new Christmas jazz. Jazz musicians love to bring a jazzy flair to Christmas and Christmas music. This year, Jazz After Hours revels through the night with music newly released for Christmas 2018 and some well-loved classic Christmas jazz! Longtime host Erika Brady puts her unique spin on Christmas, with selections from the roots of American music. Christmas music is timeless, as heard in this special hosted by Nolan Porterfield. Frank Dominguez hosts a special holiday edition of the national bi-lingual program that features music by Spanish and Latin American composers and performers presented in English and in Spanish.